In 1841-61 Elizabeth Jones lived here. In 1841 the following persons lived here: Elizabeth Jones, 51, baker; Catherine Jones, 20, her daughter; Anne Jones, 15, daughter; and Mary Jones, 13, daughter. In 1851 the occupiers were Elizabeth Jones, widow, 61, publican; Catherine Jones, 29, her daughter, baker. In 1861 Elizabeth Jones, 74, baker & publican lived here with Anne James, 35, her daughter; and Mary Williams, 18, servant. On 27th October 1866 Mary Lewis of the ‘Royal Arms’ was buried at St. Mary’s Church having died aged 40. In 1866-85 John Lewis was the occupier and publican. On 21st July 1868 David Lewis of the ‘Royal Arms’ was buried at St. Mary’s Church having died aged 1 year and 9 months. In 1871 the following persons lived here: John Lewis, 53, maltster & innkeeper; Sarah George, 45, domestic servant and Rachel Lewis, 23, domestic servant. In 1881 John Lewis, 65, innkeeper, lived here with 2 domestic servants – Elizabeth Thomas, 22; and Ellen Davies, 19. In April 1885 he was a Guardian of the Poor. He died here on 24th September 1885, aged 71. The pub is marked on the 1887 O. S. map. In 1891 Rachel James, 48, wife, lived here with her son James, 16, and Elizabeth Davies, 22, servant. The pub had an entrance on Priory Street. In April 1894 the license was transferred from Captain James James to Captain William Davies. In 1894-98 William Davies was the landlord. On 15th May 1894 Joshua Phillips Davies, son of Captain Davies, Royal Arms, died aged 7. On 30th October 1898 Captain William Davies of the ‘Royal Arms’ died aged 42. On 6th February 1899 the license was transferred to Mrs. Davies. Rubbish pits outside the pub were being filled in on 28th April 1899. In 1901 the following persons lived here: Jane Davies, 48, innkeeper (b. Moylegrove); Annie Davies, 19, her daughter (b. St. Dogmaels); William E. Davies, 17, son, apprentice mechanical engineer (b. St. Dogmaels); William H. Davies, 22, nephew, ironmonger’s assistant (b. Moylegrove); and Mary Phillips, 19, niece, domestic servant (b. Moylegrove). On 12th August 1901 Miss Mary Phillips died here, aged 20. In 1901-18 Mrs. Jane Davies, landlady, lived here. On 20th December 1905 Annie Mary Davies, 25, of the ‘Royal Arms’ married Herbert James Wood – Chief Petty Officer on the ‘Empress of India’. The pub was advertised to let on 27th June 1913, as Mrs. Davies intended to retire. On 11th November 1915 Captain D. Phillips, 74, died here at the residence of his sister – Mrs. Davies. On 27th April 1917 Private Manny Davies, son of Mrs. Davies of the Royal Arms, was wounded in action. “The Royal Arms” was advertised for sale on 20th August 1920. On 25th November 1920 there was a chimney fire here. In December 1920 David Thomas became the licensee. In 1920-26 David Thomas was the publican. On 11th February 1927 the future of the license here was under discussion. On 11th March 1927, the premises was referred for compensation. David Thomas still lived here in 1929. On 3rd August 1929 hairdresser David Morgan Jenkins opened his business here, having formerly traded at ‘Kinora,’ St. Mary Street. In 1929-86 David Morgan Jenkins, hairdresser, traded here. In 1937-56 Jenkins & Thomas accountants traded here. 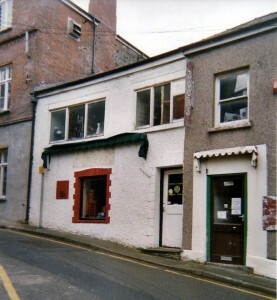 In 1986 the hairdressers and gift shop of H. Jenkins, established in 1922, moved to Pendre. There was then a china shop here. ‘Middle Earth’ traded here in 2003-08. In February 2009 the property became an antiques centre. Hi Richard. Nice to hear from you – glad to assist with the family information.